Long lauded for their health benefits (not to mention their deliciously tangy flavours) fermented foods are easier to make than you may have realised. Pickled cucumbers are a handy snack to have on hand – perfect for your sandwiches, for sleepover snacks or for crunching into any time of the day. Here’s how to make your very own dill pickles. If you like a touch of spice, you can add some chopped dried chilli to your pickling mixture. You can also experiment with your favourite herbs. If you’re unable to find all of the herbs you like, you may be able to find some pickling salts at your local store instead. First, you’ll need to make pickling brine – which consists of salt and water. Easy peasy! It’s best to use rainwater, spring water or boiled tap water (that you’ve left to cool). To make the brine, combine 20g of sea salt with 400ml of water for a one-litre pickling jar. Stir in the salt to make sure it all dissolves. Place your preferred combination of garlic (unpeeled and cut in half), spices and herbs in your jar. Then pop all your cucumbers in the jar, making sure they fit snuggly. Depending on your cucumbers, you may require more or less than we’ve recommended. Pickling is all about experimenting! Pour brine over the cucumbers so they’re completely covered and the salty water reaches the jar’s brim. Sit the lid on the jar, but don’t tighten at all! Place a tea towel or piece of cloth over the lid and secure with a rubber band or twine around the neck of the jar. Pick a storage place where family members or pets are not likely to accidentally knock your jar over. Sit your jar of pickles on a plate or dish. During the fermentation, the brine will spill over the brim. That’s normal – no need to freak out when this happens. Let the pickles sit at room temperature for five to seven days until the bright green veggies have faded to an olive-green hue. Pickles can then be kept in the fridge (with the lid now tightened) for a year or more. But it’s not likely you’ll be able to resist them for more than a week. 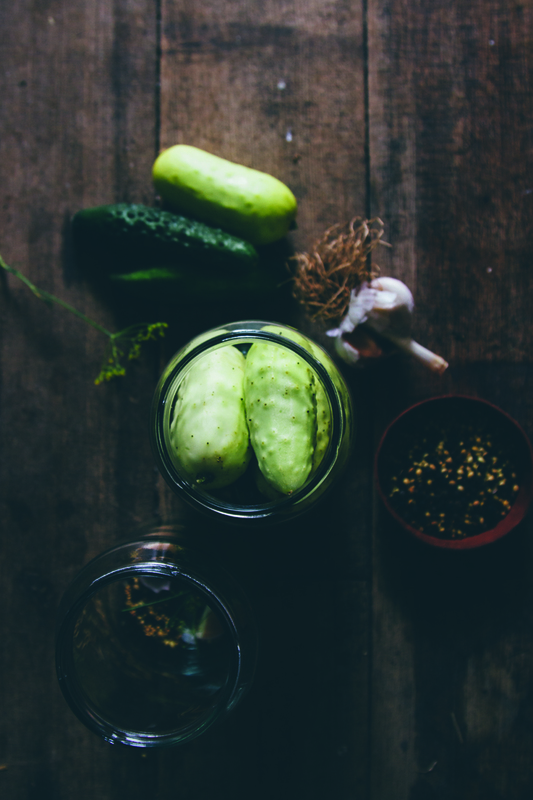 Your pickles should be kept in the fridge – otherwise they will continue to ferment. *Tip: start making your pickles one week before you intend to crack them open! Patience is a virtue, friends. Linsey Rendell is a writer, photographer and adventurer based in Melbourne. You can follow her on the grams @linseyrendell. This article first appeared in issue one of littlewren magazine.